Brands have always given it their all to grab the attention of their audiences. Well thought out marketing strategies and innovative ideas have always provided a successful structure. However, times are changing and so are consumers. It’s no longer about how brands see themselves but how consumers feel about the brand and what they want to see from them. How can brands recapture distant consumers, reach new followers and show that they’re listening? 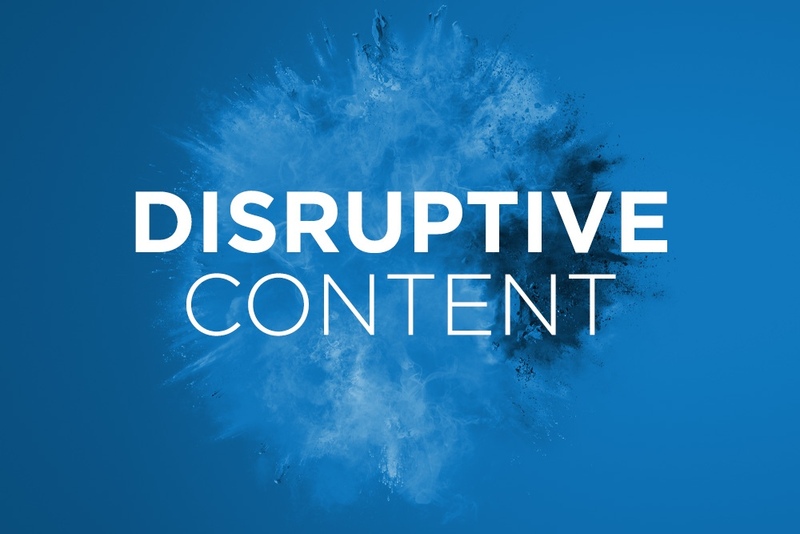 The answer…Disruptive Content. Now is the time to break the rules, face the negative feedback, listen to the customers voice and convey a stronger brand identity. The following brands have done just that by using disruptive content, as a result they have gained over 30 million views, 42 million likes and a 58.5% increase on Instagram tags. 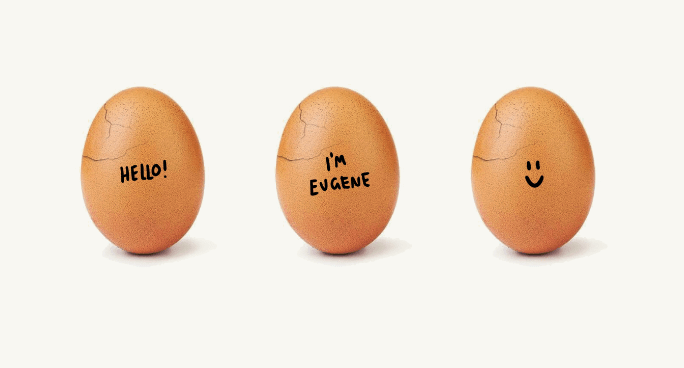 Eugene, a mysterious egg is an excellent example, whose ‘shelfie’ caused a lot of intrigue amongst Instagram users. Eugene’s mission? To beat Kylie Jenner’s world record of having the most liked picture on Instagram and promising something special. With every new set of likes, more cracks appeared. In just ten days, the egg surpassed Kylie’s 18 million likes and successfully hit 42 million likes. After some time Eugene posted a video, admitting that he was cracking under the pressure of internet fame. Eugene’s aim was in fact a Mental Health Awareness Campaign. This showed social media users that it’s okay to talk about the pressure of being online. An incredible campaign to disrupt social media stereotypes and create a conversation about an important cause. Social media platforms are a great way to receive feedback from consumers, helping brands to adapt and improve for the better. KFC wandered the realms of Twitter only to find tweets pointing out that their fries are sub-par compared to their renowned chicken. 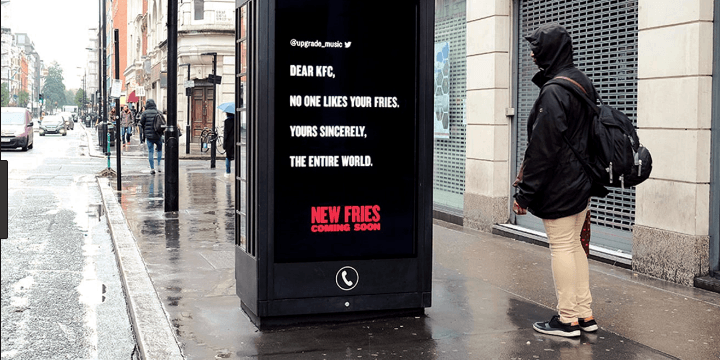 KFC cashed in on these ‘chips’, using these critiques to re-evaluate their recipe and create a campaign promoting the arrival of KFC fries 2.0. How? With well-seasoned content including strong print and display creative, making reference to these negative tweets. Turns out, this disrupted all waves of social media, generating over 500,000 engagements online. Christmas Campaigns often involve emotional narratives, family-friendly fun and mouth-watering food and dishes. Iceland skated all around these typical tropes, to take a more political stance. The frozen food retailer collaborated with Greenpeace on this project to reveal the harmful effects of sourcing palm oil, the subsequent deforestation and impact on orangutans. Where Iceland have truly succeeded is using a tearful tale, to communicate their move to ditch palm oil in all of their products. News travels fast and soon the ad became viral on social media causing an uproar of likes and shares. Not just because of its emotional and poignant message, but the fact it was banned by advertising regulators for being too political. Now who looks like the icy one? McDonalds have done their research, concluding that it’s no longer about them but about their own fast foodie followers. 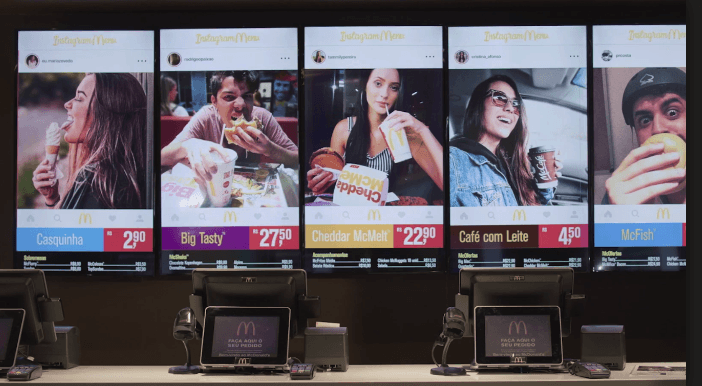 Accordingly, McDonalds created an Instagram menu, replacing the standard menu with crowdsourced imagery of their food offering. After all who knows better than the customers of a brand, they represent life appeal and honest feedback which is far more enticing. The company used hashtags to track imagery of their products and displayed it on the stores screens. An ingenious way to encourage customers to buy a burger and take a selfie, resulting in a 58.5% increase in Instagram tags. Brands are ready to disrupt the mindless scrolling on digital devices. Innovative content and genius digital marketing techniques are grasping the attention of social media addicts. If you’re in need of out of this world digital marketing and social media campaigns that make you look twice, contact Rocket and we’ll be sure to stop people scrolling.